Black homeownership: How the recession turned owners into renters and obliterated black American wealth. It was a startling retrenchment, creating the largest wealth, income, and employment gaps since the 1990s. And, if a new study from researchers at Cornell University and Rice University is any indication, these gaps are deep, persistent, and difficult to eradicate. In the study, called “Emerging Forms of Racial Inequality in Homeownership Exit, 1968–2009,” sociologist Gregory Sharp and demographer Matthew Hall examine the relationship between race and risk in homeownership. Simply put, African-Americans are much more likely than whites to switch from owning homes to renting them. This wasn’t a matter of personal irresponsibility. Even after adjusting for socio-economic characteristics, debt loads, education, and life-cycle traits like divorce or job loss, blacks were more likely to lose their homes than whites. If you’re familiar with American history and housing policy, this shouldn’t come as a surprise. The explicit housing discrimination of the mid-20th century has left a mark—arguably a scar—on the landscape of American homeownership. The combination of redlining, block-busting, racial covenants, and other discriminatory measures means that, even now, a majority of blacks live in neighborhoods with relatively poor access to capital and mortgage loans. What’s more, this systematic discrimination has left many black households unable to afford down payments or other housing costs, even if loans are available. And in the event that black households are able to save and afford a home, they aren’t as financially secure as their white counterparts. To wit, middle-class African-Americans are more likely to belong to the lower middle class of civil servants and government workers—professions that, in the last five years, have been slashed as a consequence of mass public-sector downsizing. All else being equal, a black schoolteacher who loses her job to budget cuts is less likely to have savings—and thus a safety net—than her white counterpart. But this isn’t just a story of legacies and effects. In addition to showing the consequences of past discrimination, Sharp and Hall argue that African-Americans have been victimized by a new system of market exploitation. Banks like Wells Fargo steered blacks and other minorities into the worst subprime loans, giving them less favorable terms than whites and foreclosing on countless homes. In a 2012 lawsuit, the ACLU and National Consumer Law Center alleged that the now-defunct New Century Financial, working with Morgan Stanley, pushed thousands of black borrowers into the riskiest loans, leaving many in financial ruin. 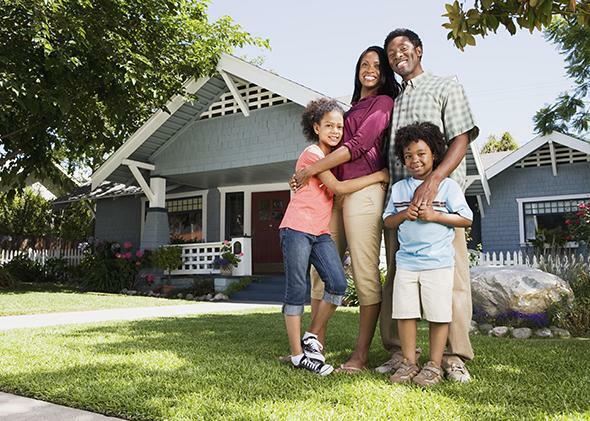 As early as 2005, the Wall Street Journal reported that blacks were twice as likely to receive subprime loans. And in a New York University study published last year, researchers found that black and Hispanic families making more than $200,000 a year were more likely to receive subprime loans than white families making less than $30,000. Together, all of this means that—according to Sharp and Hall—African-Americans are 45 percent more likely than whites to lose their homes. That means they’re more likely to lose their accumulated wealth and to slide down the income ladder, and less likely to pass the advantages of status and mobility to their children. Apropos of that observation, recent data from the Bureau of Labor Statistics shows an incredible level of youth unemployment for blacks and Latinos. More than 21 percent of African-Americans aged 16 to 24 are out of work, compared with a national average of 14.2 percent. For black teenagers in particular, joblessness soars to nearly 40 percent. It’s a catastrophe with serious economic consequences. The Center for American Progress estimates that the young adults who experienced long-term unemployment during the worst of the recession will lose more than $20 billion in earnings over the next 10 years. And given the slow recovery, odds are good they’ll never recover those lost earnings. It’s tempting to treat these as subsets of broader problems: poor assistance to homeowners and too much austerity. But they’re not. Even during the boom economy of the 1990s, black employment lagged behind the national average. And the racial wealth gap is a persistent fact of American life. Likewise, the challenges of black homeownership are a function of discriminatory housing policy, as are a whole host of other problems, from mass incarceration and overly punitive policing to poor air quality and food access. These challenges are heavily location-dependent, which is another way to say they are heavily racialized and most prevalent in the segregated, working-class or low-income communities that characterize life for most African-Americans, even those with middle-class incomes. For reasons both political and ideological, it’s nearly verboten in mainstream conversation to argue that racialized problems require race-conscious solutions. Knowing what we know about the demographics of foreclosures, for example, we should ensure any program to help underwater homeowners includes a specific measure to assist black victims of predatory lending, who may need additional help to get on sure footing. For more than anyone else, this is a message for liberals and progressives, who—for all of their racial sensitivity—are still reluctant to tackle the economic dimensions of racism, even as they represent the vast majority of nonwhite voters and draw critical support from African-American constituencies. It’s how Elizabeth Warren could give “11 Commandments for Progressives”—and receive huge applause—without mentioning the deep problems of racial inequality. One of her commandments is “that no one should work full-time and still live in poverty, and that means raising the minimum wage.” But solving this problem for African-Americans and Latinos—who tend to live in areas that are segregated from job opportunities—is very different than solving it for whites. While conservatives and Republicans can play a role here, it’s Democrats who are committed to reducing income inequality and bringing balance to our lopsided economic system. Success on those fronts requires a return to race-conscious policymaking, from programs to increase the geographic mobility of low-income workers—relocation grants for individuals or transportation grants for communities with a spatial mismatch between jobs and housing—to public works programs aimed at low-income minority communities, to race-based affirmative action as a way to boost a flagging black middle class. There’s little in American life that escapes the still-powerful pull of past and present racism, and effective policymaking—to say nothing of effective problem-solving—requires a response to that racism. Otherwise, we entrench the same disparities for a new generation.